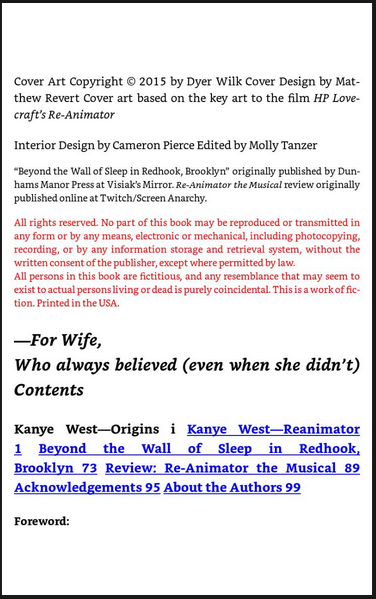 In 2015 I wrote a parody novel called Kanye West—Reanimator. It reimagined H.P. Lovecraft's story "Herbert West—Reanimator" with—you guessed it—Kanye West as the titular character. Yolo House, a kinda-sorta offshoot of Lazy Fascist Press created specifically for the book's release, published it. Then it was my job to make sure as many people as possible heard about its glorious existence. This past year, Yolo House closed its doors and the rights to the book reverted back to me. Instead of relisting it on Amazon and letting it ride, I decided to create a special edition for posterity. And money. The result is Kanye West—Reanimator: The Re-Reanimated Edition. It contains forty pages of new content, including an exclusive forward and the short story, "Beyond the Wall of Sleep in Redhook, Brooklyn." I learned a lot promoting the Yolo House version of the book, and even more putting together the special edition. Combined these lessons constitute enough knowledge for me to impart them with sage-like wisdom upon those following in my footsteps. So here goes. A book with a great cover sells itself. And my book has a great cover. Painted by the talented Dyer Wilk and aged to perfection by Matthew Revert, I like to credit it with the majority of my book's success. It catches the eye when I table, and I can tell right away when a sale is imminent. Half the time the decision is made before I even open my mouth to launch into my spiel. The unsuspecting customer already knows they want it. Professionalism pays. Pay for professionalism. The basics of InDesign aren't difficult to learn (although it helped that I had a completed project to work from). All I had to do was plug in and format the new material based on what was already there. The end result made me wish I'd subcontracted from the start. I've read a lot of eBooks from DIY types (and even small presses) that have had all sorts of terrible formatting issues and it really takes you out of the story. For the love of god, if you can't do it right yourself, find someone who can. This is text from FOUR different pages. What the hell, Kindle? If your book is self-pubbed or even if it's put out by a small press, chances are you're gonna have to act as your own publicist. The internet has opened up a vast new world of interconnectivity, but it's a world populated by people of innumerable interests. So it helps to know who you want to say what too. I was lucky in that I had a high-concept idea that appealed to (or stoked the ire of) multiple demographics: Lovecraft fans, Kanye fans, horror fans, film buffs, hip-hop heads, and general pop culture hounds. So when it came time to request coverage and reviews, I had more than the average amount of options. In addition to book blogs and literary outlets, I contacted hip-hop and popular music sites, horror blogs, Lovecraft fans and organizations (there are a lot), movie sites and more. I received breakout coverage from EW.com, The Daily Beast, Birth. Movies. Death, and Noisey, which all really helped. And let's not forget podcasts. Everyone's got one these days, and they're always looking for guests. You can be a guest! Another big one: my wife is a comic book artist, so I tagged along and tabled at comic conventions. It was the perfect crowd for my nerdy genre mash-up, one that isn't available to the typical work of literary ennui (although there are plenty of book fairs for that!). I made t-shirts, which I also sold at said conventions. A local radio station agreed to do a giveaway. I made a Spotify playlist. I made business cards of the book's cover. 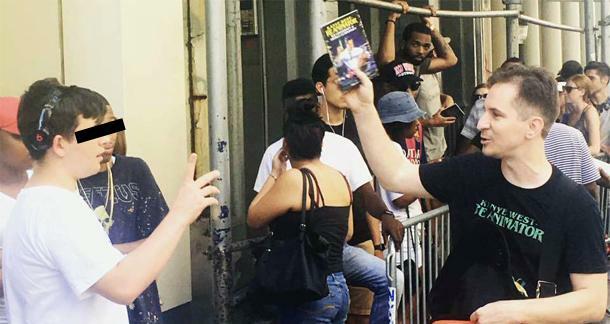 I even crashed one of Kanye's clothing pop-ups in NYC (see header). I set my sites outside the box of typical book promotion and went for it. Now I understand not everyone's book will present the same opportunities, but the point is to explore your options. Be creative in your approach. Do things that broaden your reach, as well as make you stand out in your own sphere. Here it is, over two and a half years later, and I'm still promoting this damn book. My social media friends may be sick of hearing about it, but I'm still discovering new avenues of promotion. Things like the Books on the Move movement, which distributes free books via the subway systems of major metropolitan cities. I did a giveaway in D.C., and one in Kanye's home town of Chicago. Oh, and I also discovered the joy of animated gifs! Don't get so caught up in whoring yourself out that you stop writing. Because if someone likes your work, they're gonna want more of it. Your current content acts as promotion for your future content. Attention spans are short. If you don't give people their fix, they're gonna get bored and move on to something else. The opposite is also true. Future content promotes your old content. Blog posts, non-fiction articles, and short stories you write lead people back to your previous work via your byline. So keep 'em comin'. It's like taking out a classified ad. Oh, and by the way, I've also written this... In this modern age of binge-watching and binge-reading, content is king. These are just a few of the things I learned while promoting my book. They may not all apply to your specific situation, but hopefully there's something here you found useful. Promotion isn't an exact science, and you never know what's going to provide results. Now get out there! Those books ain't gonna sell themselves!